Chief Minister Gegong Apang (since August 3, 2003). Governor S.K. Singh (since December 16, 2004. Arunachal Pradesh (अरुणाचल प्रदेश) is an Indian state. It is administered by India as a state, but China claims most of it as a part of the Tibet Autonomous Region. Arunachal Pradesh is one of two main disputed regions between India and China, the other being Aksai Chin. Arunachal Pradesh borders the Indian state of Assam to the south and Nagaland to the south east. Myanmar lies to the east of the state and Bhutan to the west. Itanagar is the capital of the state. The People's Republic of China does not recognise the state itself nor its northern boundary, the McMahon Line. Instead, China calls the area South Tibet (藏南 pinyin: Z�ngn�n), and splits the area nominally among six border counties of Tibet Autonomous Region: (from west to east) Cona, Lh�nz�, Nang, Mainling, M�dog, and Zay�. At the same time, both the PRC and India have defined a Line of Actual Control, and it is widely believed that this dispute is not likely to result in actual hostilities. Formerly called NEFA (North East Frontier Agency), Arunachal Pradesh was part of the state of Assam until 1987. It was given statehood status after taking into consideration the security situation in the east and Sino-Indian tensions. The first ancestors of the tribal groups migrated from Tibet during the pre-historic period, they were joined by Thai-Burmese counterparts later. Except for the northwestern parts of the state, little is known about the history of Arunachal Pradesh, although the Apatani tribe had legendary knowledge of the history. Recorded history was only available in the Ahom chronicles during the 16th century. The tribal Monpa and Sherdukpen do keep historical records of the existence of local chiefdoms in the northwest as well. Northwestern parts of this area came under the control of the Monpa kingdom of Monyul, which flourished between 500 B.C. and 600 A.D. This region then came under the loose control of Tibet, especially in the Northern areas. The remaining parts of the state, especially those bordering Myanmar, came under the control of the Ahom and the Assamese until the annexation of India by the British in 1858. Recent excavations of ruins of Hindu temples such as the 14th Malinithan at the foot of the Siang hills in West Siang shed new light on the ancient history of Arunachal Pradesh. Paintings of the Hindu gods and altars remained untouched for many years. They attracted many local pilgrims. Another notable heritage site, Bhismaknagar, suggested that the Idu Mishmi had a local civilisation. The third heritage site, the 400-year-old Tawang monastery in the Tawang district also provides historical evidence of the Buddhist tribal peoples. In 1913-14, the British administrator, Sir Henry McMahon, drew up the 550-mile McMahon Line as the border between India and China in Shimla, during a conference which also discussed the Tibetan and Chinese borders. 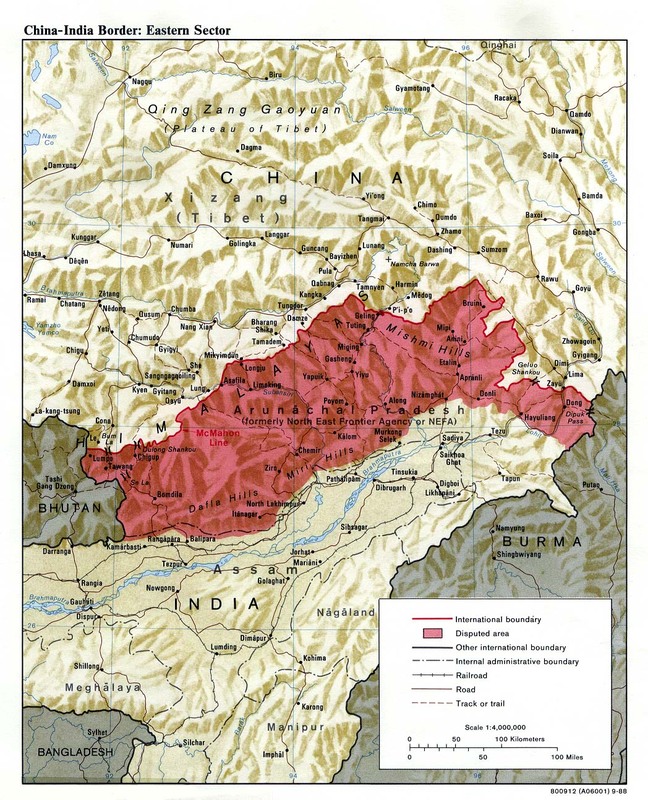 This border was later rejected by the Chinese government in 1947, saying that the claim was never approved and pointing to a map in the Encyclop�dia Britannica of 1929 which showed the Indo-Chinese border stretching right up to the border of the Assamese plains. Following this dispute, the Chinese troops crossed the McMahon Line on the August 26, 1959, and captured an Indian outpost at Longju, a few miles south of the line. They abandoned this in 1961 but in October 1962 crossed the line once again, this time in force, beginning the Sino-Indian War. After striking toward the Tanglha ridge and Tawang, which is near the Bhutan border, the Chinese later extended their attack across the whole frontier. Deep inroads were made at a number of points. However, the Chinese agreed to withdraw back to the McMahon Line and returned Indian prisoners of war in 1963. The Indian government attributes this to the preparedness of India to defend the plains of Assam, the superiority of the Indian Air Force, and Chinese logistical problems; the Chinese government maintains that political considerations were the only factor in their retreat. Following that, the entire area changed its name from North East Frontier Agency and became part of Assam. Arunachal Pradesh gained statehood in 1987 after taking into consideration the security consideration in the east and Sino-Indian tensions but was not recognized by China. Much of Arunachal Pradesh is covered by the Himalayas, although parts of Lohit, Changlang and Tirap are covered by the Patkoi Hills. The climate of Arunachal Pradesh varies with elevation. Areas with very high elevation in the Upper Himalayas near the Tibetan border enjoy an alpine or Tundra climate. Below the Upper Himalayas come the Middle Himalayas, where people experience a temperate climate. Fruits like apples, oranges, etc are grown. Areas at the sub-Himalayan and sea-level elevation experience a humid sub-tropical climate, with hot summers and mild winters. The state receives heavy rainfall of 80 to 160 inches (2,000 to 4,000 mm) annually, most of it falling between May and September. The mountain slopes and hills are covered with alpine, temperate, and subtropical forests of dwarf rhododendron, oak, pine, maple, fir, and juniper; sal (Shorea) and teak are the main economic species. Arunachal Pradesh is divided into fifteen districts, each administered by a district collector, who see to the needs of the local people. Especially along the Tibetan border, the Indian army has considerable control over the territory due to the continuing concern about Chinese intentions. In the Northern areas and areas near the Indo-Burmese border and Nagaland, where Naga-Christian militant groups have been alleged of harassing the local people, special permits are needed to enter the area. 65% of the Arunachalis belong to 20 major-collective tribes and 82 tribes, who had a heritage of a diverse and rich culture, language and beliefs. Most of them are either of Tibetan or of Thai-Burmese origin. Another 35% of the population are immigrants, including 30,000 Bangladeshi and Chakma expartriates, and immigrants from other parts of India, notably Assam and Nagaland. The most notable tribes include the Adi, Nishi and Monpa. The literacy of the State rose to 54.74% from 41.59% in 1991. As of today, the number of literates is 487,796. About half of the state population follow the Donyi-Polo religion. Another 42% follow Buddhism and Hinduism, with Christians and Muslims accounting for the remainder. Agriculture is the primary driver of the economy. Jhum, the local word for shifting cultivation, which was widely practised among the tribal groups has come to be less practiced. The forest-products are the next most significant sector of the economy. Among the crops grown here are rice, maize, millet, wheat, pulses, sugarcane, ginger and oilseeds. Arunachal is also ideal for horticulture and fruit orchards. Its major industries are sawmills, plywood (these two trades however have been stopped by law), rice mills, fruit preservation units and handloom handicrafts. Arunachal Pradesh is dominated by the Arunachal Congress, which is headed by the Chief Minister Gegong Apang. Other opposition parties include the Arunachal Congress (Mithi), Congress (Dolo) and the Peoples Party of Arunachal. The state's airports are located at Itanagar, Daparjio, Ziro, Along, Tezu, Pashigat. However, owing to the rough terrain, these airports are mostly small and cannot handle many flights. The unspoiled environment of Arunachal Pradesh has attracted tourists from many parts of the world. There is also significant locally arranged tourism to see the cultural diversity of Arunachal Pradesh, places from Bomdila and Tawang to Tirap. This page was last modified 02:05, 19 Jun 2005. This page has been accessed 5838 times.